Using eagle.io, Pentair have been able to sand-box connected product applications with their clients in Food and Beverage, Aquaculture, Pump and Valve Markets. Eagle.io also provides a scalable custom solution to connect, view and control connected products such as those produced by Pentair. Pentair has identified an opportunity to connect a range of products sold to provide a value add offering to traditional products in their service lines. The products and applications are widely varied, from remote control and monitoring of aquaculture products deployed, to health monitoring of filters and automatic re-ordering, and potentially to convert standard product sales to services to generate recurring revenue. The engineering team at Pentair have been seeking a tool they can use to both rapidly build and test their connected product initiative with end users, being able to iterate dashboards, notifications and alarms to meet end users’ needs. Image 1 Artists representation of Pentair Sea Pen Aeration and Oxygenation System. Using Eagle.io, Pentair are sandboxing remote monitoring and control applications for a range of end benefits – including centralised operations, predictive maintenance and consumable monitoring. 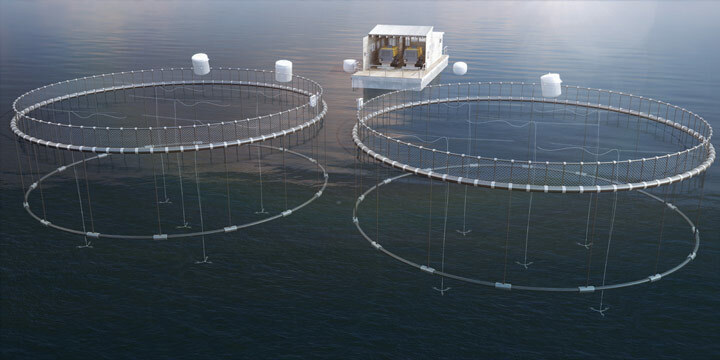 For their clients in the ocean aquaculture sector utilising the Sea Pen Aeration Systems, eagle.io allows Pentair to offer to their clients the ability to remotely monitor key quality metrics such as Dissolved Oxygen levels, and provide an endpoint for site operators to upload physically monitored parameters, such as invertebrate species and abundance data. Using eagle.io, operators are able to review environmental data gathered from sensors in real time to take corrective action using the Pentair Aeration System, such as turning on aerators to cycle deeper cleaner water to flush out problem plankton. Image 2 Screenshot of eagle.io dashboard used by Pentair aquaculture client. "We’ve tried to achieve these outcomes with products produced by other large software companies. We’ve even shown them eagle.io and challenged them to match its ability to rapidly build dashboards, connect to monitor devices – presently, they simply can’t. I can be on the phone with a client literally on the other side of the world, discuss with them what they’d like to see on their dashboard, change it on my account and have it appear instantaneously in front of them." Postal address: Level 3/155 Queen St, Brisbane City QLD 4000 - © 2019 Argos.io Pty Ltd. All rights reserved.